The idea is/was that faith and community-based groups have been providing and will continue to provide direct service (soup kitchens, housing support, etc.) to those in need and that this is a good thing! But we must also ask the question, as people of faith, what is our part in helping to change the overall systemic issues that create a society where people are hungry, homeless, and lacking education and opportunities to thrive? 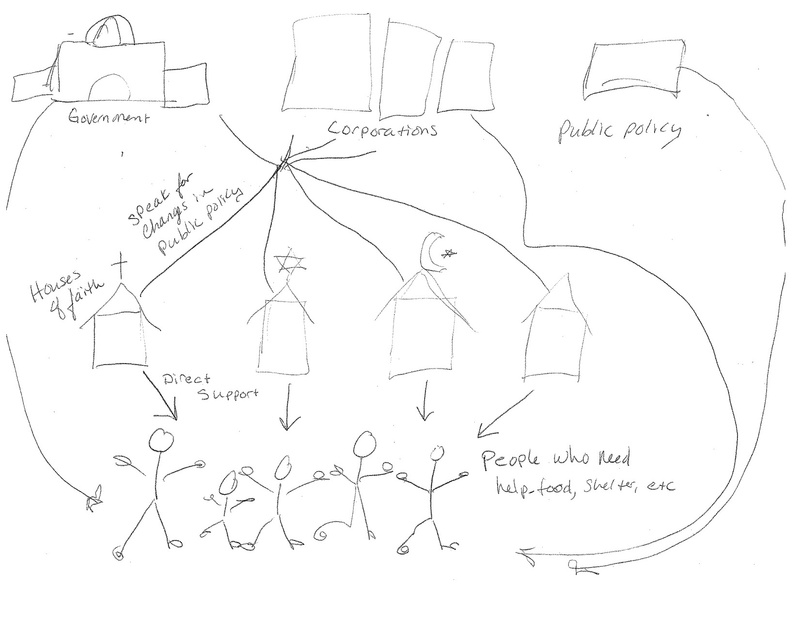 What is our role as people of faith, in looking at how large corporations, government, and the decisions of powerful leaders have a direct effect on the levels of poverty and struggle in the world? Now I know this concept isn’t brand new news and we can say, “Yeah, yeah, been there, done that.” But something struck me that morning. Suddenly I was one of the people who not only could be, but was in the process of being called to a voice from the faith community to speak up for change and transformation in our world. This was different for me. I can no longer be a friendly observer, I cannot hide behind my desire to avoid offending or disagreeing with anyone (be they my friends or people I’ve never met). I cannot quietly go about my life and be sure that “someone else” was taking care of it all. In that room that day a piece clicked—whether at the end of the day I like the fact that faith voices are intimately involved with policy and governance, the reality is that currently they are. Rather than resisting and considering myself apart, I am being moved to show up and be in the conversation. I am called as a person of faith and a faith leader to prayerfully and humbly, confidently and clearly, speak into conversations that are integral to how people are being treated and how our society operates. Conversations, that’s another piece that is showing up all over this puzzle. During my second fellowship week, Bread for the World hosted its bi-annual gathering, including Lobby Day where we were trained, empowered and sent to the hill to talk to our congressional leaders. I will confess that I had some anxiety about this plan. There’s something a wee bit intimidating to think about entering these towering buildings, through security, and sitting down with “CONGRESSIONAL STAFF”. The night before Lobby Day I was walking back from the metro, thinking and praying, and the Still Small Voice whispered, “It’s a conversation. You know how to have conversations, Anna.” Oh. Yeah, good point. I’ve taken that moment with me into a number of house and senate office meetings and have had the opportunity to not only enter into conversations, but begin to build relationships with some of the staff of my congressional offices, including (by chance) a house rep that I’m being nudged to reach out to. Conversations. Conversations change us and when we show up and keep listening and speaking, I actually believe change can happen. I think when we can sit across a table and look at another human being, connect on things we care about, and truly engage in each other’s views, the Divine shows up and moves. To be continued . . .